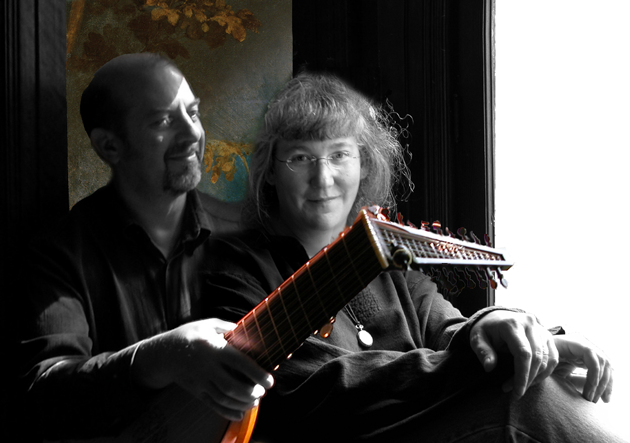 One of the few professional lute song duos in the United States, Mignarda's fresh and engaging approach to historical music has set a new standard for interpretation, authenticity and musicianship. Based in Cleveland Heights, Ohio, they have produced twelve critically-acclaimed CDs and a series of editions of historical music for voice and lute. Lutenist Ron Andrico has been a professional performer of historical music and music in theatre for more than 30 years, discovering the lute while completing a degree in composition. He promptly divested himself of all modern musical trappings and set about researching the context and subtleties of early music. His research has led to publication of a growing series of important music editions and scholarly articles that have to do with identifying, elucidating and performing the sources of 16th century lute music. In addition to his 13 editions of historical music for voice and lute, Andrico has edited and published the original lute solos of virtuoso lutenist Ronn McFarlane. His publications also include an exhaustive errata list for the complete works for lute by John Johnson (Editions Orphee) in conjunction with noted Harvard musicologist, John Ward; several articles identifying new concordances published by the Lute Society (UK) and by the Lute Society of America, for which he served as a director from 2000-2002. He is the author of the internationally-popular blog, Unquiet Thoughts. Mezzo soprano Donna Stewart, known for her warm tone and crystalline delivery of text, has received critical acclaim for awakening modern audiences to an appreciation for historical music. Her firm grounding in the practical application of Gregorian chant and medieval and renaissance polyphony stems from more than a decade with a five-voice schola cantorum dedicated to providing liturgical music for a weekly Latin Tridentine Mass. Drawing on the unique experience of singing this music in its liturgical context, she has developed an understanding of the use and form of historical sacred music, which lies at the very heart of all early music. In addition to her solo work with Mignarda, she has performed and recorded on the Koch and Onda labels with internationally-renowned Baroque orchestra Apollo’s Fire, and is recognized as having the ideal voice for renaissance lute song and crossover folk styles. The couple met in Cleveland, Ohio, singing Gregorian chant & renaissance polyphony in a small schola for a weekly Latin Mass. Their first concert came a few months later, in October of 2003. As the newly-formed duo Mignarda, they soon retreated to a remote log cabin in the wilderness of the Siskiyou Mountains to immerse themselves in the repertory and the aesthetic of the 16th century - emerging occasionally to seek advice from insightful performers Nigel North, Hopkinson Smith, and Anthony Rooley, and to tour as a trio with the Baltimore Consort's Ronn McFarlane. Eventually relocating in the eastern US, they made their home for a decade in a handmade house in the forest of rural upstate New York before settling back in Cleveland Heights, Ohio. Now celebrating their 15th year as a duo, they have travelled tens of thousands of miles to share this music with audiences across the U.S.
Duo Mignarda is unique in that their musical background mirrors that of the typical musician of the Renaissance: They bring the music to life because they live the music. Together, the duo specialize in performing music that resides in the grey zone between folk and art music, with interpretations that follow the renaissance ideal of 'moving the passions' of the listener. Capturing the nuance and intricacy of early music with warmth and flair, Mignarda’s performances remind 21st century audiences that at one time this was pop music. Mignarda, based in Cleveland Heights, Ohio and rural upstate New York, is available for concerts, house concerts, lecture-recitals, or in a format tailored to meet your needs. Please contact us for details & terms.